The period covered by Arts:Search is January to August 1901. Available. Monthly. Published December 1896-August 1901. 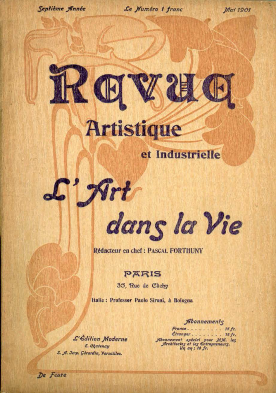 A short-lived Art Nouveau journal. Contains well-illustrated articles on contemporary French architecture and decorative art. Includes features on the hotel and restaurant interiors, furniture, electric light fittings, stained glass, art metalwork, mural painting, shop window design, wallpaper, pottery, etc. Issues of this journal are very scarce. It would appear that the Bibliothèque nationale de France does not to have a compete run as they have only digitised 12 of the 37 issues published between 1896 and 1899 for their Gallica project. [see: https://gallica.bnf.fr/ark:/12148/cb32856377x/date]and, and there are only two locations in the USA listed on WorldCat.